Today I tried a no-knead bread recipe from Steamy Kitchen and O.M.G!!!! Although I hadn’t left it to rise for the 12 hours required ( I did 8), I got the most amazing bread. A wonderfully crisp crust with an amazingly soft inside! I’m not going to lie, not kneading it means that you have to wait hours for it to rise, but the end result is awesome! Next go round, I’m going to add 7 seeds so I can get a more grainy and fibrous bread! I was so excited, I couldn’t wait to get a decent picture of it, so forgive me. It was. And I do mean was … it’s done! That’s just an excuse for me to do another one! LOLOL! There is something about the experience of making your own bread. I have only done so a couple times, but each time it tasted like the best bread in the world. Probably because I knew how much work went into it. 🙂 Well done you! I totally get where you’re coming from. It felt good to go to sleep with the smell of bread in the apt. Yah for you! 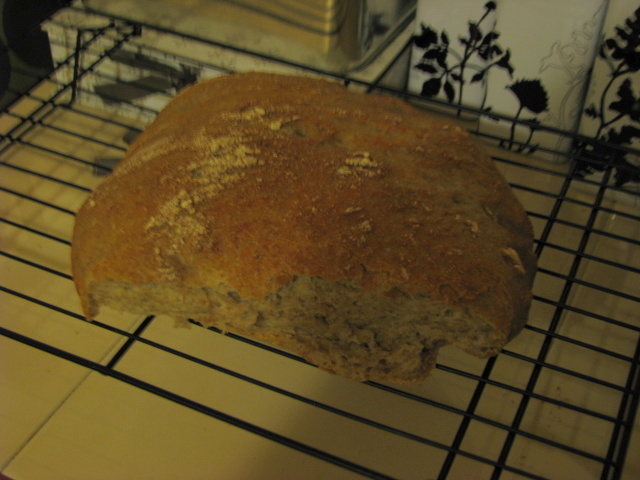 I remember when I made my first edible loaf of bread, I had a huge feeling of accomplishment! Very soul satisfying. Yes indeed. That’s how I felt eating it with my crock pot made spinach and peas soup yesterday.